E-waste diversion has stalled due to a lack of awareness. Do you ever find yourself asking, where can I dispose of my electronics? How about conveniently dropping them of at a Toronto Public Library branch or another location near you! 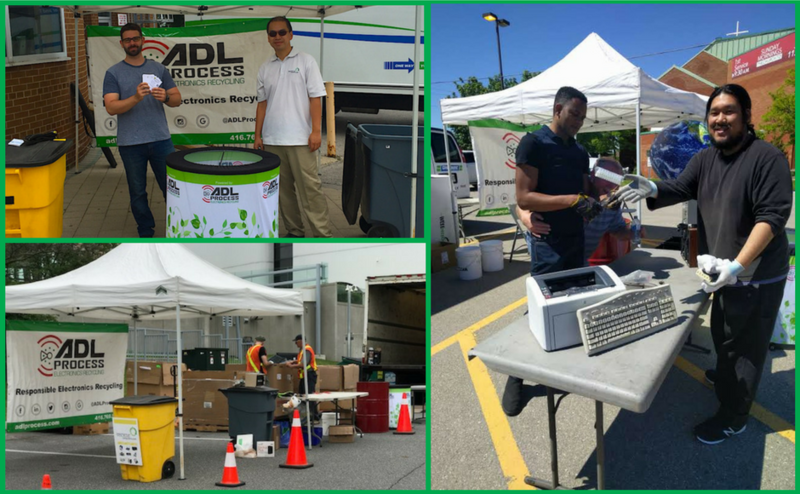 ADL Process, in partnership with the not-for-profit organization Inorganic Market, selected branches of the Toronto Public Library and other partners, is organizing for the 2nd year an e-waste community awareness and collection program. With the increasingly high pace of technology advancements, we see an accelerated replacement rate of electronic devices. But what happens to devices rendered obsolete? Developing good recycling habits to divert e-waste from the main waste stream starts with informing and educating the public on what options are available to them. This is why, throughout Spring and Summer 2018, we are back with more events in returning and new locations across the GTA in an effort to promote green thinking in regard to electronics. We will hold events where local communities across the GTA can conveniently and safely drop-off their used electronics, and learn more about how their recycling effort benefits the environment. We will accept a wide range of used electronic that includes computers, phones, tablets, TVs, printers,… View the full list here. For more information about the events, visit the ADL process Facebook page or contact Laurent Ho at [email protected]. We hope to meet many of you!